The Google Nexus 4 is the first Nexus device made by LG, it is closely related to the LG Optimus G but as Nexus fans will know, they are different in many important areas. The key things that differentiate a Nexus handset from other Android devices are mostly about software. Nexus handsets come without the dubious add-ons supplied by carriers and manufacturers, and they are always the first smartphones to see new versions of Android with much longer OS support than non-Nexus devices. The Nexus 4 is a powerful beast with a 1.5GHz quad-core processor inside with an impressive 2GB of RAM, there's a large 4.7" 768 x 1280 pixel true HD display on the front, an 8 megapixel primary camera on the back plus a 1.3 megapixel video calling camera. The Nexus 4 also supports NFC and Wireless charging. The internal memory is a pretty limited choice between an 8GB or a 16GB configuration. There's no mention of a microSD slot, and frankly we think that this isn't enough storage for a high-end device such as this. The operating system is Android 4.2 "Jelly Bean" - yes, you read that correctly, Android 4.2 is still called Jelly Bean when the rumours were that it was going to be called Key Lime Pie instead. Go figure. The large 2100 mAh battery is quoted as giving up to 15 hours talk time and 16 days stand by time. 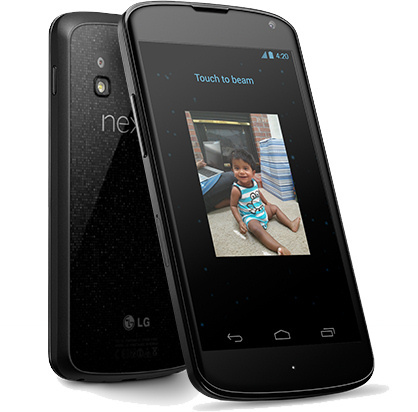 The Nexus 4 measures 134 x 69 x 9.1mm and weighs 139 grams. Surprisingly, this isn't a LTE device but it does support HSPA+ data where available. Of course, all the standard connectivity options are here such as 3.5G support, WiFi, Bluetooth and USB, and the Nexus 4 also has GPS navigation, but there's no mention of GLONASS. 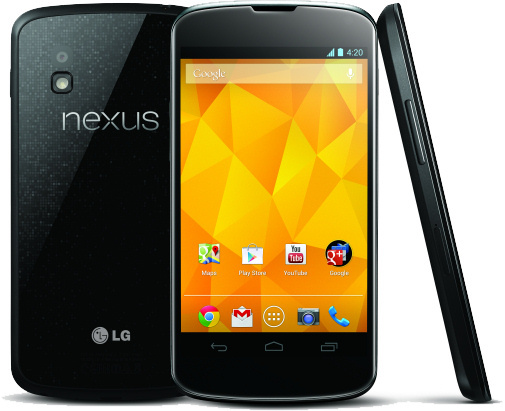 The Google Nexus 4 is a pretty big deal for LG who have been struggling in the handset market a little recently. LG and Google say that it should start shipping from November 13th in the US, UK, France, Germany, Spain, Canada and Australia with most other markets following by the end of the month. In the US, the 8GB version will be $299, the 16GB version is $349. In the UK it is £239 and £279, and we would expect prices in the Eurozone to be the same as the dollar price, so expect to pay €300 or so for the basic version.